At a time of modern advancements in medical practice and technology, pervasive and complex health issues continue to pose a serious threat to individuals, societies and governments around the world. Nutritionist and alternative health advocate Bob Barefoot puts forth an idea—go back to basics and harness the natural therapeutic properties of nature. This is the main thesis behind his latest product—a health supplement made with a medically known “super food”—called Bob’s Best Chlorella™. Bob’s Best Chlorella™ is made with Barefoot’s specially chosen, superior pyrenoidosastrain of chlorella—a single-celled, fresh mountain spring water grown plant and whole food from pure green algae. According to various sources, chlorella can be used to help reduce radiation treatment side effects, boost the immune system, increase white blood cell counts, improve digestion, reduce cholesterol and asthma attacks, treat various diseases including hypertension, and detoxify the body, among other health benefits. Barefoot explained that the chlorella in Bob’s Best Chlorella™ has the highest known percentage of chlorophyll in the world. The chlorophyll and fiber in each cell assists your body’s ability to get rid of heavy metals, pesticides and every day toxins making it a powerful purifying agent. Second,this new, certified organic health supplement was designed to help the body boost its natural defense system to better fight off disease-causing germs and microorganisms. It also aids in the stimulation of the body’s health-protecting T-cells. Third, because of its effective purification properties, Bob’s Best Chlorella™ is also helpful in fighting off the harmful effects of aging. Chlorella Growth Factor, unique to chlorella, provides a rich source of nucleic acids and polysaccharides, also known as the body’s building blocks, which help stimulate and revitalize the body as it ages through cell renewal and restoration. This translates to a natural youthful glow. 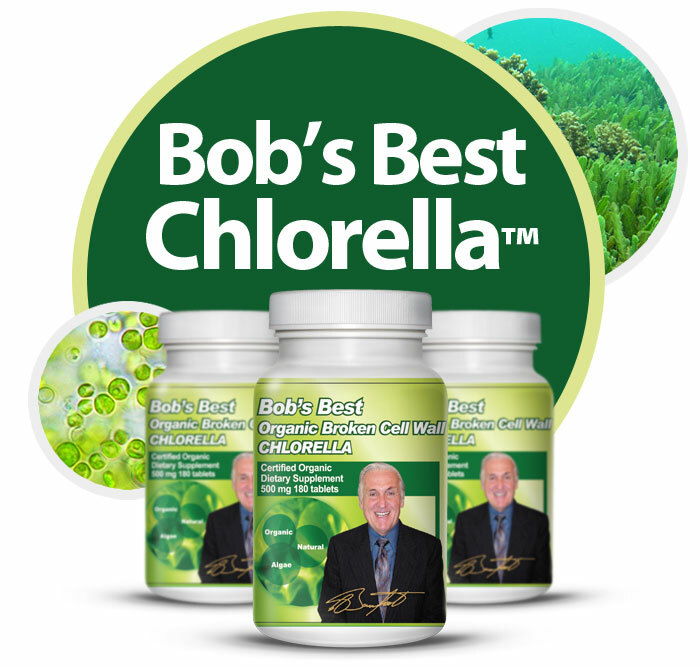 Finally,Bob’s Best Chlorella™ is a good source of “super energy” because the chlorella in this supplement acts as a catalyst that helps the body’s cells absorb more oxygen. Low oxygen levels have been linked to increased incidences of fatigue and a feeling of overall weakness. According to Robert Barefoot, Bob’s Best Chlorella™ differs from most health supplements in the market today in that it has a unique composition which takes into consideration the preservation of naturally-occurring health properties. Bob’s Best Chlorella™ uses meticulously grown (in full sunlight and pure mountain spring water) and harvested chlorella algae from the island of Taiwan (formerly known as “Formosa”) which has been proven to produce the highest quality and cleanest variety of the ancient pyrenoidosa chlorella algae strain. There search and production of the product has been carefully supervised by Barefoot himself, who has established a strong following in the alternative and natural supplement industry. Barefoot is also known for his extensive research on the health benefits of natural minerals (coral calcium) and natural vitamin d3. His other health supplements have received rave reviews from happy and satisfied users who swear by its effectiveness. Bob’s Best Chlorella™ is now available from Coral Calcium Direct with a 100 percent satisfaction assurance. Today, March 24th, is World Tuberculosis Day. World Tuberculosis Day is a day to raise awareness about the infection and solutions to support worldwide control efforts of tuberculosis. Tuberculosis (TB) is a bacterial infection. The bacteria, Mycobacterium tuberculosis, commonly attacks the lungs, but can also infect other parts of the body such as the kidneys and brain. TB can cause fevers, pain in the chest, weakness, and coughing up blood and phlegm. 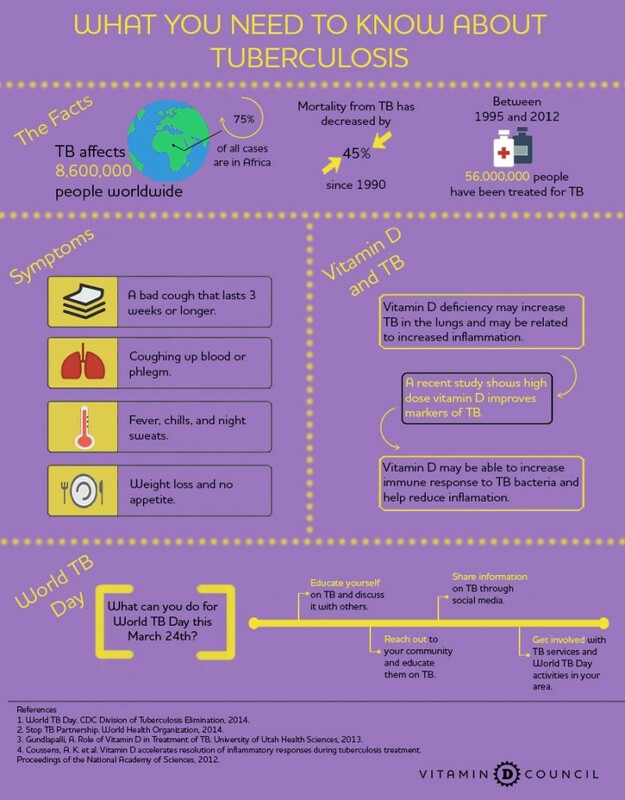 If not treated, TB can lead to death. There are about 9 million people each year who are diagnosed with TB. Seventy-five percent of these cases occur in Africa. People with HIV or other health problems have a difficult time fighting infection and are more at risk for TB. TB can be spread when someone coughs or sneezes and others nearby breath in the bacteria. Some research suggests that vitamin D supplementation may help some aspects of TB. In fact, in the early 1900s, cod liver oil and sunshine were used as treatment therapies for TB, suggesting a role for vitamin D in helping those with TB. 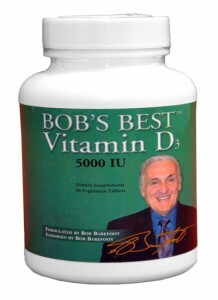 Some newer research also suggests that vitamin D supplementation is helpful if you have TB in order to speed recovery. Vitamin D can bind to immune cells and help these cells fight against and contain the TB bacteria. Researchers are also interested if vitamin D can help in improving lung function and breathing among those with TB. People newly diagnosed with TB often have low vitamin D levels compared to people who don’t have TB. Thus, doctors and scientists think that low vitamin D might be a risk factor in contracting TB. The World Health Organization and the International Union Against Tuberculosis and Lung Disease created the first World TB Day in 1982, one hundred years after Dr. Robert Koch discovered the bacteria that caused TB. World TB Day is a time to become aware and educate others on the prevalence of TB and how it can be stopped. For 2014, the theme of World TB Day is “Reach the 3 million”. Of the 9 million people diagnosed each year with TB, around 3 million people don’t receive the health services they need. Fundraise. You can help contribute by fundraising and donating to the research and development of TB treatment therapies. Spread the word. Form a local World TB Day planning committee to come up with different strategies and activities using the Stop TB resource guide. You can also download and print Stop TB awareness posters to share in your local community. Attend an event. Find an event or activity in your community to join and help spread awareness on the need for access to TB treatment options. See a list of activities and events, here. Join a patient organization. If you have TB, you can join a patient organization to help be a powerful advocate for improved access to diagnosis and treatment of TB. Coral calcium is a dietary dietary supplement that people can consider to increase their calcium needs. But similar to other nutritional supplements, it’s unavoidable which international students have individuals which are skeptic as a subject of the unintended results of coral calcium. If you’re undoubtedly one of these folks, it is an excellent point which you just come across doing so post as you’ll learn the essence and what coral calcium can do for you, in a healthy, and not harmful, types. To begin with, it’s worthwhile to know which coral calcium is and the stick it originated. Shigechiyo Izumi was the personalized behind coral calcium. He is more than a hundred and ten years old, but he’s nonetheless thought of in a outstanding healthful declare even with the old age. By the revelations of anesthesia exams, Izumi’s secret to wholesome and extensive lifestyle was discovered to be his permament usage of Japan coral calcium. The coral reefs, which kind the place where Izumi lives, produce coral calcium he makes use of as a health supplement. These reefs had been seen to have completely various substance composition related to the skeleton of a individual body type. The mix of a variety of elements and minerals resulted from the rainwater synonyms which creeps by suggests of the coral reefs. The rainfall water effortlessly turns into plentiful using crucial dietary vitamins and has excessive alkalinity of seven to 8.5 pH value. Greater compared to 2500 varieties of coral might be identified all through the world. Nevertheless, it is thought that Japan coral calcium has the most special mineral structure a lot useful to the human body type. Due to this, students have now over 4 million individuals now in Japan by yourself who use coral calcium in their daily lifestyle. Coral calcium is large in 70 four touch of minerals akin to calcium and magnesium, which are essential to the functioning of the body type cells. The dietary dietary supplement forced from doing so calcium is frequently discovered in capsule sort; nevertheless, most producers have made it in powdered sort which must be blended with liquid beverages as intake. Various firms possess also improved the benefits or undesired side results of coral calcium by mixing untried and yellow phytonutrients to over sea coral calcium. It may be well-known that a lot of the ailments at this time are connected with mineral deficiencies. A few of these illnesses include coronary center sickness, most cancers, diabetes, kidney stones, gall bladder, and arthritis. These precise illnesses could be advanced by building above sea coral calcium in the eating regimen of the particular person as it helps remodeling by supplementing important vitamins and minerals, which are mandated to meet correct pH, or possible hydrogen, steadiness in their body type. PH stability is outlined to be the volume of hydrogen ion focus promote in a fluid. 7 is thought of the balanced or impartial determinant on a scale of 14. Individual body is no cost of sickness if its pH consider solely ranges from 7 to eight as a size. Otherwise, it is acidic once it falls beneath 7 and alkaline when above 7. The correct negative effects of which includes coral calcium into the day by day food regimen are almost nothing however valuable to the normal wellbeing and stop illnesses joined to calcium deficiency. Because the people age, a lot of the critical micronutrients mandated to maintain lifestyle are depleted due to certain factors. For that reason, such as coral calcium in the food regimen is a much better and healthful method to curb its impact to your wellbeing. An ideal Coral Calcium readily available is from Bob Barefoot who is a Scientist and Chemist and professional on Coral Calcium.